The Australian discovery of a strange exoplanet orbiting a small cool star 500 light years away is challenging ideas about how planets form. 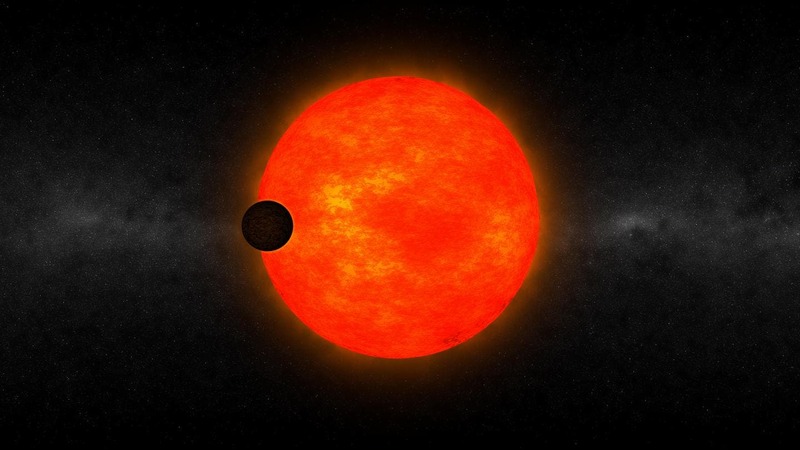 "We have found a small star, with a giant planet the size of Jupiter, orbiting very closely," said researcher George Zhou from the Research School of Astrophysics and Astronomy at The Australian National University. "It must have formed further out and migrated in, but our theories can't explain how this happened." In the past two decades more than 1,800 extrasolar planets (or exoplanets) have been discovered outside our solar system orbiting around other stars. The host star of the latest exoplanet, HATS-6, is classed as an M-dwarf, which is one of the most numerous types of stars in galaxy. Although they are common, M-dwarf stars are not well understood. Because they are cool they are also dim, making them difficult to study. HATS-6 emits only one twentieth of the light of our sun. The giveaway that the faint star had a planet circling it was a dip in its brightness caused as the planet passed in front of the star, observed by small robotic telescopes including telescopes at the ANU Siding Spring Observatory. To confirm the signal was a planet and not a blip in the system, Dr Bayliss called in help from one of the world's largest telescopes, the Magellan Telescope in Chile, and an amateur astronomer, T G Tan, who operates from his backyard in Perth. "T G Tan has been really helpful on our projects. He was able to catch the transit of the planet from Perth, after it had set over our horizon," Mr Zhou said. Subsequent observations from the Chilean telescope, and spectra taken from the ANU 2.3 metre telescope at Siding Spring, confirmed the planet had an orbit of just one-tenth that of Mercury, and orbits its star every 3.3 days. "The planet has a similar mass to Saturn, but its radius is similar to Jupiter, so it's quite a puffed up planet. Because its host star is so cool it's not heating the planet up so much, it's very different from the planets we have observed so far," Mr Zhou said. "The atmosphere of this planet will be an interesting target for future study."